Music class and physical education are usually two separate courses for children at school, but when you're teaching your child at home or your child is in preschool, music and fitness can be combined. By combining music and fitness, you teach children the importance of moving their bodies and staying fit while listening to enjoyable music to recognize sounds, patterns and instructions within the songs. Listening to favorite, silly songs can get toddlers and preschoolers excited about moving their bodies and create a lifelong love of fitness. By making your own homemade musical instruments, you can help small children make music while they move their bodies. The book "Purposeful Play" suggests sewing jingle bells on wrist straps for wrist bells, placing rice into small cereal boxes for maracas and allowing children to beat on the floor with sticks for a drum. Turn on a music CD and have children dance around while creating their own music. Children can experiment to see which instrument makes which sound while moving their bodies. Jump Bump can be played with a variety of soft materials and types of music. The Iowa State University Cooperative Extension suggests suspending an object like a beach ball from the ceiling, a few inches above the height of most of the children. Turn on music and have children jump and attempt to bump the ball with their heads in time with the music. Experiment between fast and slow music to help perpetuate a conversation about differences in rhythm. Allowing children to dance freely can help them experiment with self-expression. 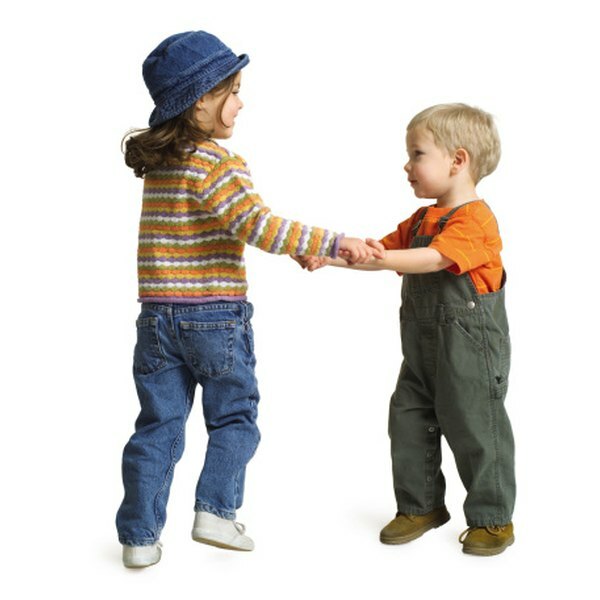 Offering props for dancing can help them explore movement in different ways. KidsHealth.org, a division of the Nemours Foundation, suggests using silky scarves as a way to show the difference in music pitches. Hand out scarves and have children raise them and lower them with the pitch of the music. Or, hand out cut-out stars on sticks as magic wands, hats and other costume elements to see how the children use them in movement. The freeze game is set to music and tests a preschooler or toddler's coordination and listening skills. Children walk around in a circle while listening to upbeat music. When you stop the music, all the children must freeze. Any child that continues to move after the music stops is out of the game and becomes a class cheerleader. Continue the game until there is one clear winner. Then, make up different ways to play the game, like having the children touch their nose when the music stops.